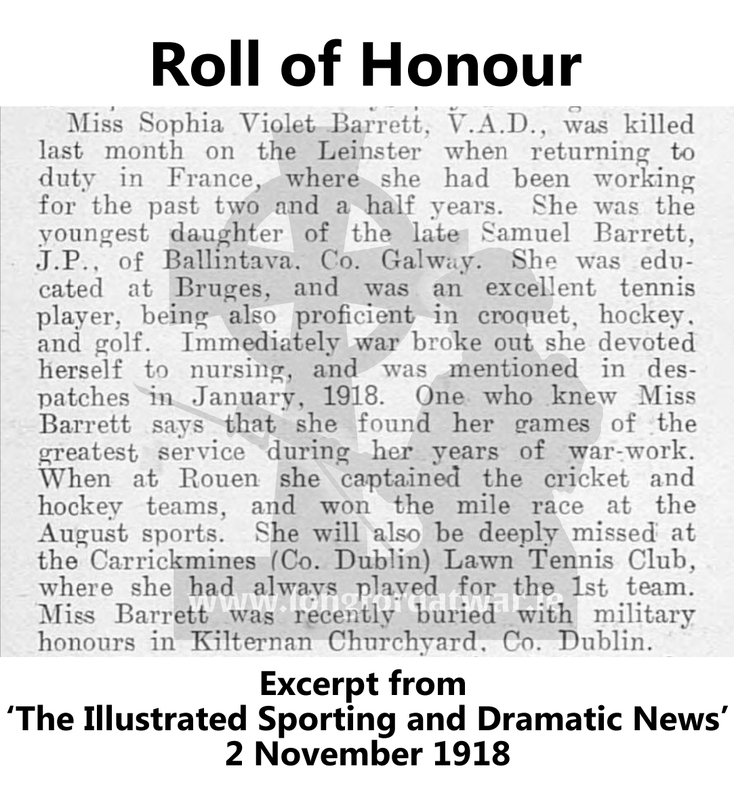 Sophia Violet Barrett was born on 21 January 1884 in Ballintava, Co. Galway, daughter of Samuel Barrett. In 1907, she inherited Lislea House, Kenagh, on the death of her brother George Henry. Her sister Elizabeth married Noble Armstrong and they lived in Lislea with Violet. At the time of her death, Violet was said to have been engaged to be married to Noble Loftus Phillips, of Glanmore, Kenagh. 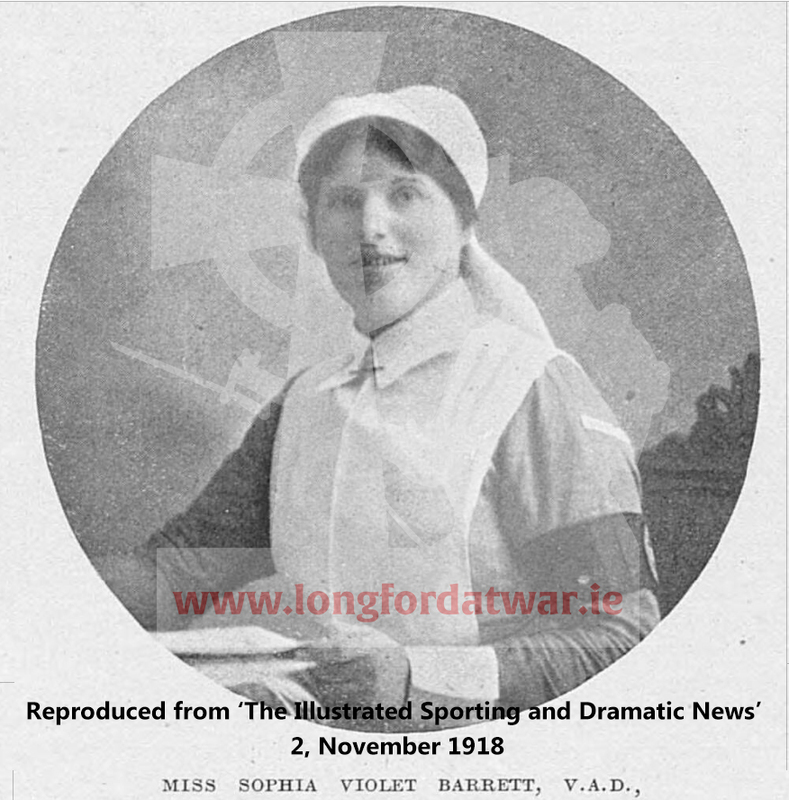 During WW1 Violet served in Voluntary Aid Detachment (VAD) with the Carrickmines Nursing Division as a nurse with the St. John's Ambulance. 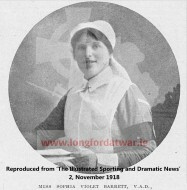 Initially she served in Dublin but from April 1915 to April 1916 she was stationed in the East Leeds Military Hospital. From April 1916 she was deployed to field hospitals in France, initially being stationed at the No. 6 General Hospital in Rouen up to August 1918 aftrer which she was deployed to the No. 2 Stationary Hospital in Abbéville. She was mentioned in Despatches in January 1918. 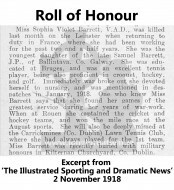 She returned to Ireland on leave from France in early October 1918 and stayed with her aunt and her husband in Carrickmines House, Foxrock, before embarking on R.M.S. Leinster to return to the front. The R.M.S. Leinster was the mail boat between Dun Laoghaire (then Kingstown) and Holyhead. The mail ship was sunk by torpedo on the morning of the 10 October 1918, resulting in the loss of 501 souls, out of 777 (although some counts put the actual number of people on board as higher). See references in Philip Lecane, 'Torpedoed! The R.M.S. Leinster disaster' (Dublin, 2005).